As we head towards the end of the year, to the holiday season and to Universal Children’s Day on November 20th, I am thinking about the children. And even more, I am thinking about some specific children whose fortunes have been changed, whose futures have been made more hopeful – indeed, whose lives have likely been saved – through the generous support of Canadian Feed The Children donors. And that’s really something to celebrate! 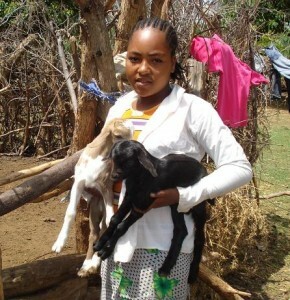 Shukare holds two baby goats, part of the gift of livestock that has helped her family generate a sustainable income. Two years ago, Shukare was a 12-year-old girl living with her extended family in Ethiopia. They were poor, and she was the oldest girl in the family. In Ethiopia and other African countries, that combination often means the end of childhood for ‘tweens’ (and those even younger) like Shukare. If they are in school (and more than 50 per cent of Ethiopian children are not; a number even higher for girls), their schooling is discontinued. To their impoverished families, a young girl’s value is higher as a child labourer, and even higher as a child bride. But Shukare was one of the lucky ones. She was within the catchment area of a CFTC local partner in Hara Dembel, Ethiopia. Serving the region’s most destitute families, Shukare and her brothers and sisters were enrolled in school – a school that offered a feeding program which relieved Shukare’s family of some of the costs they faced attempting to keep their children well-nourished with virtually no family income. Shukare with her younger brothers and sisters. And speaking of family income: CFTC was able to offer Shukare’s family agricultural training, livestock, tools and seeds to give them a sustainable income. Through that training, they were also sensitized to the value of education for their girls. Shukare is still in school, and her family makes a modest income by farming goats, cows and chickens – enough to support Shukare and her younger brothers and sisters; enough to ensure their childhoods are not cut short by poverty, desperation and necessity. Shukare is featured in this year’s Best.Gift.Ever campaign: her story shows the incredible impact even a small gift – like a school uniform; three chickens or a goat; or agricultural training – has had on one child, a family and an entire community. 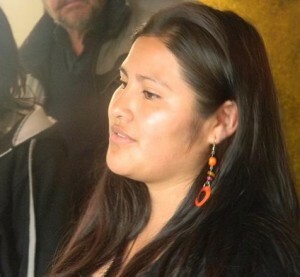 Silvia tells her story to participants on the recent CFTC donor tour to Bolivia. With her rosy cheeks, shiny black hair and stylish earrings, Silvia bears absolutely no resemblance to the frightened, sick five-year-old who was living on the streets of La Paz more than ten years ago. Orphaned and vulnerable to the very worst outcomes anyone could imagine, like so many of Bolivia’s estimated 800,000 homeless children, Silvia had the incredible good fortune to be found by an Alalay social worker and taken to one of Alalay’s Villages. Silvia was fed, clothed, and enrolled in school. And most of all, she was cared for and loved, taught that she was a valued and worthwhile human being. That care and love let her not just attend school, but excel in it. She won a scholarship and is now training to be – you guessed it – a social worker. Silvia wants to dedicate her life to helping other children get the same help she did so they can transform their lives and so – like her – they not only survive, but thrive. 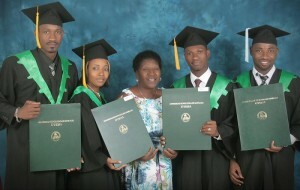 Wencyl Fortune, Johnny Belany, Carnes Bien-Aimé, Roselène Laflute and Wilson Louis have recently graduated from university. Here they are shown at left (Wilson was unable to be present for the photograph) with their “mom” Alice. They could be any other group of friends posing with a parent on a day that celebrates their great achievement, couldn’t they? But they are not just any group of friends: they are Haitian, they were orphaned, and they have faced almost insurmountable obstacles to get to a point that many of us, our children and grandchildren might take for granted. Each has survived not only deprivation and abandonment on a personal level – but they have grown up in a country of regular, ongoing political instability and natural disaster. Once they were taken under the wing of “Mom” Alice Barthole at House of Hope Orphanage in Gressier, Haiti, a world of opportunities opened up. Under Alice’s steadfast direction, House of Hope not only provides for the physical needs of its residents, but places an extremely strong focus on education. It’s a cliché to speak of recent graduates as representing the best and brightest of their country’s future, but in this case, that cliché rings true. Johnny studied accounting; Canes and Roselène, business administration; and Wilson is now an industrial engineer. I have no doubt that they will put these skills to use to rebuild Haiti and “pay it forward” in honour of Alice, not just for giving them shelter and love, but for inspiring them to succeed through the strength of her own belief that they would. Yes, it’s about the children and the great potential that lies within every one of them. As we reflect on Universal Children’s Day, as the year draws to a close and the season of hope, joy and giving is upon us, I hope you are inspired by these children, and join me to celebrate their success and the fulfillment of their potential.